Thanks to USDA’s Borlaug Fellowship Program, an African researcher is in the United States acquiring knowledge that will help protect farmers’ livelihoods and improve food security on his home continent. Kwame Ogero, a research associate at the International Potato Center in Tanzania, is working with mentors at Louisiana State University (LSU), learning to use cutting-edge technologies to test for viruses and produce clean sweet potato cuttings for planting. Sweet potatoes are an important source of nutrition and farmer income in many parts of Africa and the Sweet Potato Research Station at LSU’s AgCenter is the only facility of its kind devoted solely to studying and improving them. 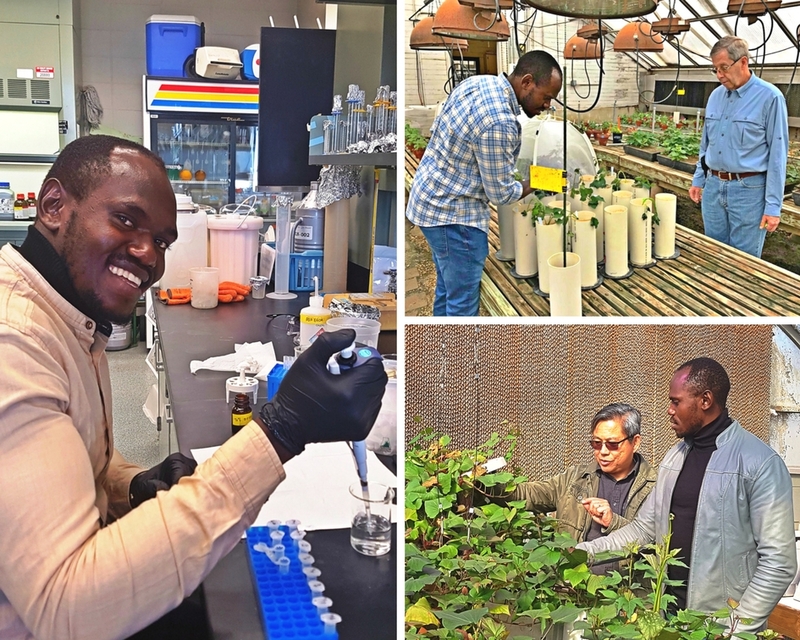 USDA Borlaug Fellow Kwame Ogero from the International Potato Center in Tanzania conducts research on virus prevention in sweet potatoes with his Louisiana State University mentors Christopher Clark (top right) and Arthur Villordon (bottom right).